China tortured, harassed, and imprisoned “hundreds of thousands” of Muslims and Christians in 2017 for practicing their faith outside of the control of the staunchly atheist Chinese Communist Party (CCP), the U.S. Department of State (DOS) noted in a report released on Tuesday. Beijing’s religious restrictions and abuses mainly target Muslims, Buddhists, Christians, and Falun Gong practitioners. China is subjecting many adherents to “transformation through re-education” inside camps where they are forced to listen to propaganda and subject to intensive monitoring outside the facilities, all intended to ensure the worshippers remain loyal to the Communist Party. 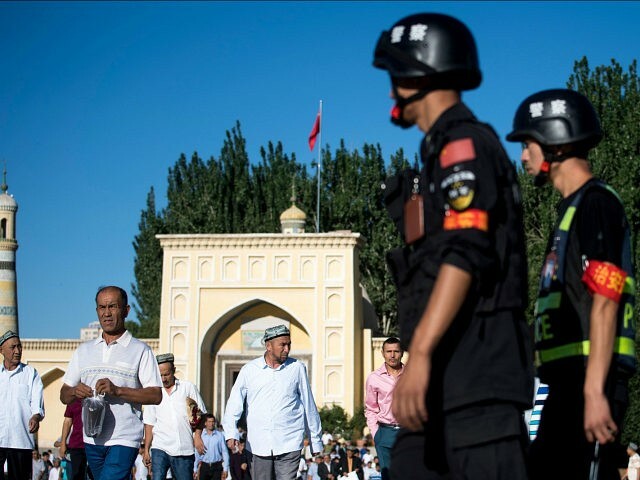 It is estimated that hundreds of thousands of Uighur Muslims have been forcibly sent to re-education centers, and extensive and invasive security and surveillance practices have been instituted. … Many of these camps have been registered as “career development centers” to circumvent legal problems. Reports indicated authorities sent Muslims and some Christians from ethnic minority groups to re-education. Beijing’s offensive against the faithful is part of Chinese Communist Party leader Xi Jinping’s effort to “sinicize” the nation — make China more Chinese. [In 2017,] the government continued to exercise control over religion and restrict the activities and personal freedom of religious adherents when the government perceived these as threatening state or Chinese Communist Party (CCP) interests, according to nongovernmental organization (NGO) and international media reports. Worshippers who are “registered” are also facing oppression at the hands of the Chinese government. There continued to be reports the government tortured, physically abused, arrested, detained, sentenced to prison, or harassed adherents of both registered and unregistered religious groups for activities related to their religious beliefs and practices, including members of unregistered Christian churches (also known as “house churches”). Echoing the U.S. Commission on International Religious Freedom, human rights lawyer Bob Fu told Breitbart News communist China’s President Xi Jinping is increasinglycracking down on worshippers, mainly Muslims and Christians.